Ronaldo RESEDA/ROBSON JORGE/LINCOLN OLIVETTI E Novamente Mas Que Nada vinyl at Juno Records. The 65th volume in Mr Bongo's admirable Brazil 45s series shines a light on Rio De Janeiro's turn-of-the-'80s boogie scene. On the A-side you'll find "E Novamente Mas Que Nada" by Ronaldo Resado, a five-minute chunk of samba-laced boogie sunshine that was originally featured on the artist's eponymous 1979 debut album. 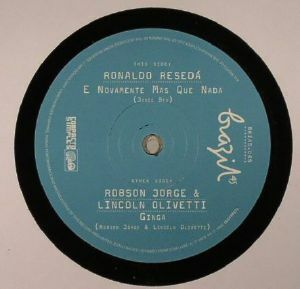 While wonderful, it's slightly overshadowed by flipside cut "Ginga", one of the highlights from Robson Jorge and Lincoln Olivetti's sought-after 1982 full-length (which, incidentally, was recently reissued by Mr Bongo and is well worth checking). Joining the dots between synth-heavy electrofunk, horn-toting disco-funk and languid jazz-funk, the instrumental track is arguably one of the best Brazilian boogie records ever made. Don't sleep.